The demand for oil and gas drives exploration and production in to more and more complex environments. Grant Jennings and William Kikendall report. Operating efficiently in complex environments necessitates a precise understanding of the physical environment. Modern exploration techniques include: increased towed streamer lengths, higher streamer counts, tighter spacing, ocean bottom seismic and electro magnetic geophysical sensing. More and more often these state-of-the-art systems are deployed in deep water and/or ocean environments with complex ocean currents. Given the risks and high operating cost associated with these environments, it is critical to understand the ocean's physical characteristics and their impact on the efficiency and safety of seismic survey operations. In recent years, acoustic Doppler current profilers (ADCPs), have become the tool of choice onboard survey vessels to provide a clear understanding of real-time current speed and direction profile, playing a crucial role in survey operations. - Gaps in the seismic data along survey lines. Today's streamers can be deployed with spacing as tight as 25 metres for up to 17 streamers and vessels are being built with reels to accommodate up to 26 streamers with a towable footprint of more than 10 square kilometres - a sizable area by any standard. The pre-programmed 'lawn moving' pattern of the seismic vessel is designed to allow for optimal coverage; however, ocean currents can play a significant role on how well the streamers adhere to this planned track. Surface and near surface currents can result in streamer feathering, or lateral drift. If the currents are understood, the surveyor can adjust his course in real-time to compensate for this drift. However, left unattended, this drift can result in large data gaps requiring costly infill data; and in extreme cases, streamer tangling, resulting in downtime with significant associated cost. - Equipment damage during deployment and recovery. Ocean currents can exert tremendous force on streamer cables and winches. These forces can cause tangling and/or significant damage to equipment during deployment and recovery activities, resulting in lost time and/or costly repairs. In addition to the physical damage to the equipment, the effects of these currents create an increased risk to the crew. By understanding the forces at work, these events can be managed to coincide with a low flow state, or the vessel can be positioned to a more favourable environment. - Incorrect touchdown positions during ocean bottom seismic (OBS) surveys. Ocean currents have a significant impact on the horizontal travel during the deployment of ocean bottom cables and stand alone sea floor instruments. This is also a factor in the buoyancy dependent recovery of sea floor instrumentation. An accurate knowledge of the ocean current structure provides the data necessary to accurately deploy and efficiently recovery these instruments. An acoustic Doppler current profiler (ADCP) is a sonar that measures and records water current velocities at up to 128 points, over a range of up to 1000 metres, through the water column. An ADCP operates by transmitting acoustic pulses into the water column. These acoustic pulses propagate through the water column and are 'reflected' by suspended particles which are carried by water currents. The reflected signals (echoes) are received by the ADCP. Echoes arriving later, from deeper in the water column, are assigned greater depths in the velocity profile. This allows the ADCP to form vertical profiles of current velocity. Particles within the current flow moving towards the instrument exhibit higher frequencies while those moving away exhibit lower frequencies. This is the famous Doppler shift, which enables precise measurement of current speed and direction, providing a unique and complete view of the water column. 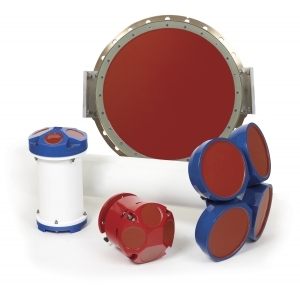 Teledyne RD Instruments (originally RD Instruments) designed and manufactured the industry's first ADCP in 1982, and has since sold nearly 15,000 of these instruments for a wide array of current profiling applications. The company's vessel-mounted family of ADCPs collects detailed maps of the distribution of water currents through the water column and along the ship's path - at depths and resolutions previously considered unattainable. In real time, the ADCP proves a crucial tool for in-situ decision-making, allowing surveyors to adapt field operations to improve their operations. Teledyne RDI's ADCPs have supported seismic survey operations for many years. One of the industry's largest suppliers of turn-key current monitoring solutions for seismic operations is Fugro Global Environmental & Ocean Sciences (GEOS). Fugro GEOS, a member of the larger Fugro Group, is a supplier of meteorological and oceanographic services and systems for offshore and coastal engineering applications. Teledyne RDI has supplied Fugro GEOS with more than 40 ADCPs for installation onboard a wide range of seismic survey vessels. Fugro GEOS installs, integrates and supports ADCPs, and interfaces them with Fugro GEOS' custom SeisADCP software package. The package was developed in unison with seismic navigators to optimise the use of current data in support of precise seismic operations. The SeisADCP package manages the operation of the ADCP system and displays surface current data in real-time as they are gathered. The displays are designed to allow seismic navigators to identify the oceanographic features that may affect operations, such as rapid changes in current velocities (valuable when shooting lines and deploying equipment); longer-term changes in current velocity (necessary when planning the shooting of lines and deploying equipment); and current velocity shear with depth (for stacking streamers and deploying ocean bottom cables). Powerful and dynamic ocean currents are a reality for seismic survey operators. Teledyne RD Instruments Broadband ADCPs are a proven tool for understanding the physical ocean environment, and allow operators to adjust their survey plans to incorporate, as opposed to fighting, these elements.